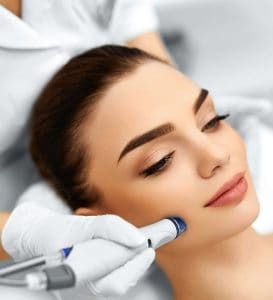 Microdermabrasion consists of micro-crystals which are propelled through a small, hollow, pencil-like hand piece across the skin’s surface, removing damaged and dead cells with vacuum pressure. It is an effective acne treatment and reduces scars, wrinkles, and hyper-pigmentation. Its overall result is that it leaves the skin smoother, softer, healthier and more youthful looking. One of the most popular, affordable and result oriented treatment on the market today. Includes face and neck. Consist of micro-crystals which are propelled through a small, hollow, pencil-like hand piece, removing damaged and dead cells with vacuum pressure. For skin resurfacing, acne, uneven skin tone. Leaves the skin smoother more even-toned, softer, healthier and youthful looking. This treatment will buff away dead skin and impurities with microdermabrasion. It will smooth out skin texture, fine lines and wrinkles. We will apply a Bio-molecular Hydrating Recovery Mask for 10 to 15 minutes that will hydrate and leave dull skin radiant and more plumped. Beautiful results! 30-minutes micro we stop under the jawline.